I was really hesitant to pick this up because I wasn’t crazy about The Wife Between Us, from the same authors, but I’m glad I gave into the hype. 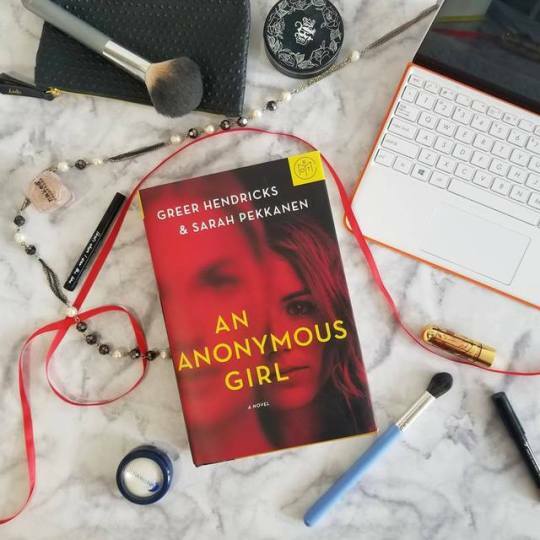 An Anonymous Girl is a fast paced and super fun and twisty thriller which follows the story of Jessica, a young and struggling 20-something makeup artist who worms her way into a psychological study after she hears they’re offering a suspiciously high compensation for participation. What does she have to lose? The nature of the experiment is a bit foreboding from the very beginning. Jessica is prompted by a computer to respond to various questions about her personal history and sense of morality. Some of her more superficial answers are rejected as she is urged to dig deeper. Jessica’s answers hint at a dark secret in her past that the reader is not yet privy to. Meanwhile, her entanglement with the experiment and the psychologist in charge of it becomes more and more involved as the story progresses. As with a lot of thrillers, it’s difficult to say much without giving away plot points which are best discovered organically. Suffice it to say that An Anonymous Girl has a healthy balance of foreshadowing and surprise, a protagonist who is flawed without being ridiculously unlikable, and a villain who, despite being just as over-the-top as one comes to expect in a thriller, has a believable backstory and motivation. An Anonymous Girl is a roller coaster ride that will keep you speeding through pages to the end. Thank you for reading! What was the last book that pleasantly surprised you? Let’s discuss in the comments! Next Post Book Giveaway on Tumblr!